Sorry for the late update, ladies and gents! Got caught up with prepping our Thanksgiving dinner last week but now I’ve found time to give a rundown of how my AUD/CAD swing trade turned out. I’ve been holding on to this trade for quite some time already and even though I didn’t do so well with my initial short attempt, I’m pretty happy with how I tried again! As I notated in the chart above, I tried to get in after the test of parity then added at a break of the .9900 support but my adjusted stop at .9950 was hit. Afterwards, I decided to play the retracements instead of the breakdowns and got a smoother ride down. As I mentioned in my Twitter update, I decided to close before Thanksgiving, as it appeared that the pair was having trouble breaking below the .9600 major psychological level. After all, I did plan on playing it carefully once price hit that established support zone and I got quite a few comments warning me about a potential bounce from that area. All in all, I got a decent win with this one, as I scraped a 1.5-to-1 return on risk for my second short attempt. Not bad, I suppose? ‘Til the next trade, fellas! Just a quick update on this swing trade, ladies and gents! Since price keeps trending lower, I thought it would be safe to move my stop a tad below my latest entry level (.9850) and place it at the .9800 major psychological mark to lock in some pips. However, I’m still open to adding yet another position and pressing my advantage. At the moment, the pair appears to be finding support around .9650 and might be ready to retrace to the .9700-.9750 area. I’m keeping my bearish bias on this pair because, as Pip Diddy mentioned in his Asian session update, Goldman Sachs just gave a downbeat outlook for the Australian economy. Prior to that, RBA official Lowe was quoted saying that the Australian dollar is trading at historically high levels and that he wouldn’t rule out a central bank intervention just yet. Talk about more jawboning! For now, I’m up by close to 1% on my open trade, effectively giving me a pretty decent 2:1 return-on-risk. Do you think it would be wise for me to add to my position or should I just play it safe from here? I’m sure many of you are wondering whether my AUD/CAD short is still open… Well, it is! In fact, I’ve already decided to move my stop to entry (0.9900) now that price has moved roughly 150 pips in my favor. The pair has quite a long way to go before reaching my first target at .9600 but it seems that the downward momentum is still strong. After all, with the recent disappointment over China’s 3rd plenum, traders might not be so eager to buy up the Australian dollar. With that, I thought it might be a good idea to add to my short position and press my advantage again. 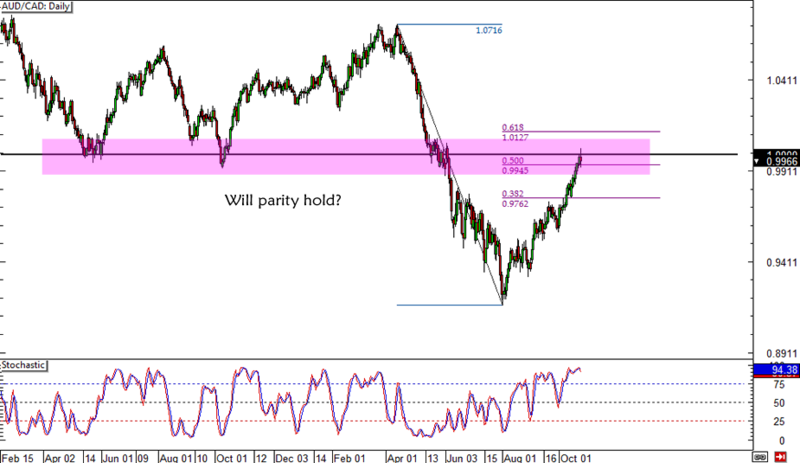 As Big Pippin pointed out in his Chart Art, AUD/CAD could retrace to the 0.9850 area before resuming its selloff. Do you think it’ll still reach that entry area though? 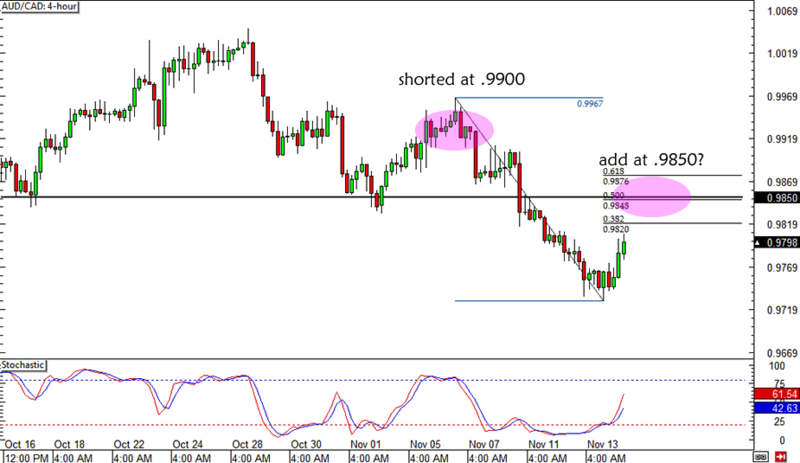 Here’s a short but sweet update on my AUD/CAD short trade! 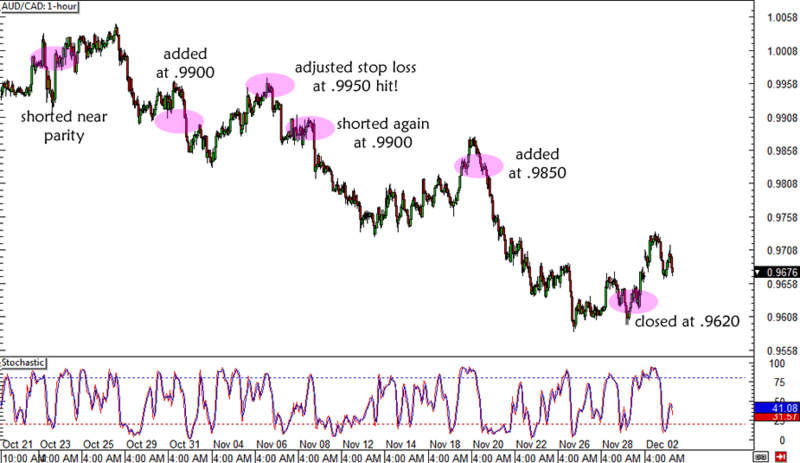 Unfortunately, my adjusted stop loss around .9950 was hit when risk appetite improved in yesterday’s trading sessions. As Pip Diddy mentioned in his revamped trading session updates, the combination of the strong performance in Asian equity markets and relatively better-than-expected data in the London session was enough to keep risk on. However, fresh economic data from Canada and Australia convinced me that I should re-enter this trade and retain my short bias. After all, Canada printed a much better than expected Ivey PMI reading of 62.8 versus the estimate at 54.7. On the other hand, Australia just released a very weak jobs report that showed a mere 1.1K rise in hiring and an increase in its jobless rate. With that, I decided to short again around .9900 with a stop loss safely above the previous highs. Do you think this pair will keep heading down though? It looks like RBA Governor Stevens is at it again! In the RBA’s monetary policy statement today, Stevens mentioned that the Australian dollar is trading at uncomfortably high levels and that a depreciation might be needed to spur further growth in the country. Although policymakers decided to keep rates unchanged at 2.50% for now, Stevens cited that economic performance has been below trend and that it’s too early to tell whether the recent pickup can be sustained or not. 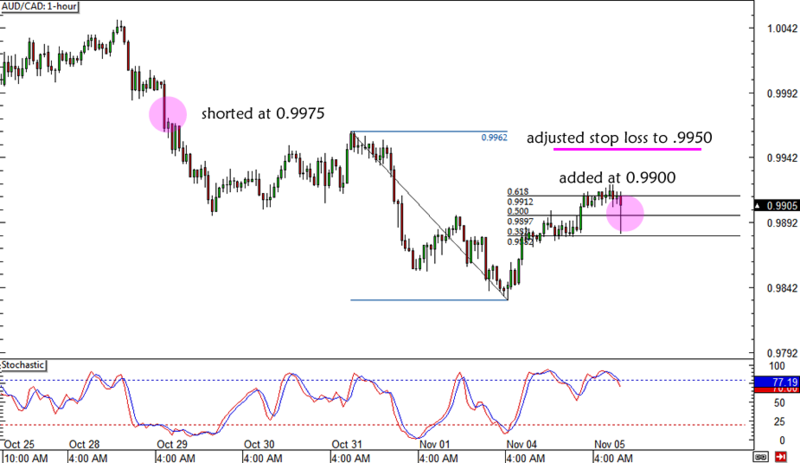 With that, I decided to press my advantage on this short AUD/CAD setup. After moving my stop a few pips below entry to lock in some profits, I added another short position on the pullback to the .9900 major psychological level. After all, this lines up with the Fibs on the 1-hour time frame. 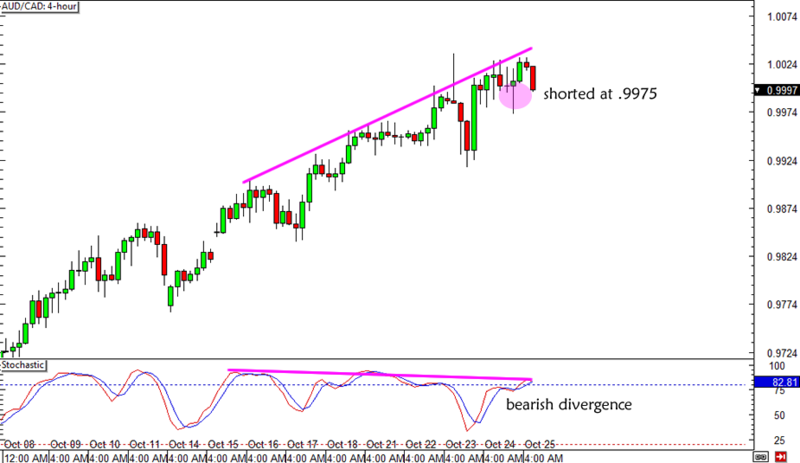 I’m seeing a bearish divergence with stochastic, too! Do you think AUD/CAD will resume its downtrend within the day and possibly test its previous lows around .9850? Let me know if you think my decision to add was a good idea or a bad one! So far, so good! Thanks to RBA Governor Glenn Stevens and the run in risk aversion, AUD/CAD is finally showing some downward momentum. You see, earlier this week, Stevens started talking about the negative impact of the Aussie’s appreciation on their economy. This was enough to send a lot of Aussie bulls scurrying away! I am tempted to move my stop to entry at this point, but I reminded myself that my plan was to give the trade a wide enough breathing room until the pair tests the next support level around .9600. Do you think that’s too far away though? At the moment, stochastic on the daily time frame just crossed down from the overbought region, showing that bears are in control. I’ll be keeping close tabs on what’s going on in Australia, Canada, and even China to figure out if I need to make any adjustments soon. I’ll keep y’all posted! Here we go! After patiently waiting for confirmation signals, I finally decided that it’s time to hop in this AUD/CAD short trade. On the 4-hour time frame, I saw a bearish divergence forming as price kept making higher highs while stochastic was showing lower highs. As I mentioned in my Twitter update also, I spotted a reversal candlestick on the daily chart, which led me to think that parity will hold as resistance. I was able to short at market at .9975 and I set my stop roughly 150 pips away in case price makes several tests of the 1.0000 mark in the next few days. As I mentioned in my trade idea, I am ultimately aiming for the .9200 handle but I plan to adjust my stop to entry once price gets halfway there, possibly around .9600. One thing that worries me though is that Canada’s fundamentals aren’t looking very solid right now, as the BOC recently downgraded their growth forecasts. Meanwhile, Australia might have brighter prospects since China printed a stronger than expected HSBC flash manufacturing PMI. However, the recent spike in Chinese money market rates could mean a period of low liquidity and potentially weaker growth for the Asian superpower. This could drag the Australian dollar down much later on, so I’m preparing to hold on to this swing setup for weeks. What do you guys think? Any feedback would be appreciated! Now here’s a technical setup that’s too sweet to ignore! After months of rallying, AUD/CAD is testing resistance right at parity. This happens to be around the 50% Fibonacci retracement level on the daily time frame and is right smack in line with a former support area! Stochastic has reached the overbought region but has yet to cross down, which shows that Aussie bears are still waiting to pounce. The question is, do fundamentals also line up with this short AUD/CAD setup? Earlier today, we saw a wave of selling during the Asian session, as news of a Chinese debt write-off hit the airwaves. Apparently, several Chinese banks have decided to erase several bad debts off their balance sheets, prompting traders to worry that banks will be in for huge losses or potential default. With that, we saw a drop in Asian equity indices and a rally for the lower-yielding yen, which is a classic sign of risk aversion. The Australian dollar also dipped lower, as the prospect of a default among large Chinese banks could eventually hurt demand for Australian raw material exports. Of course I’m also gonna keep tabs on the BOC interest rate decision later today, as this could determine whether the Loonie will be able to rally or not. I’m still waiting on a little more confirmation for this trade though, perhaps a sign of downward momentum if stochastic starts moving down or a reversal candlestick on the daily or weekly time frame. I’ll just post a quick update on Facebook and Twitter if I jump in at market, all right? I plan to set my stop above the 61.8% Fib level, which should give the trade around 150 pips of breathing room. I’m aiming for the .9600 level as my first target and the .9200 handle as my next target. So, what do you think of my trade idea? I know I’m kind of picking tops and bottoms here but I have a good feeling that parity will hold as resistance this time. Do you agree?